I want to have a cell with the header values, then a separator, then the values of a row, then a different separator. And I want this to happen for each row while the header values remain the same. Formula for 50 columns and the required number of rows. $A$1:$AX$1&":"&$A2:$AX2 creates a text value of headers and values separated by a colon. Add the formula to a free cell on row 2 then fill down. 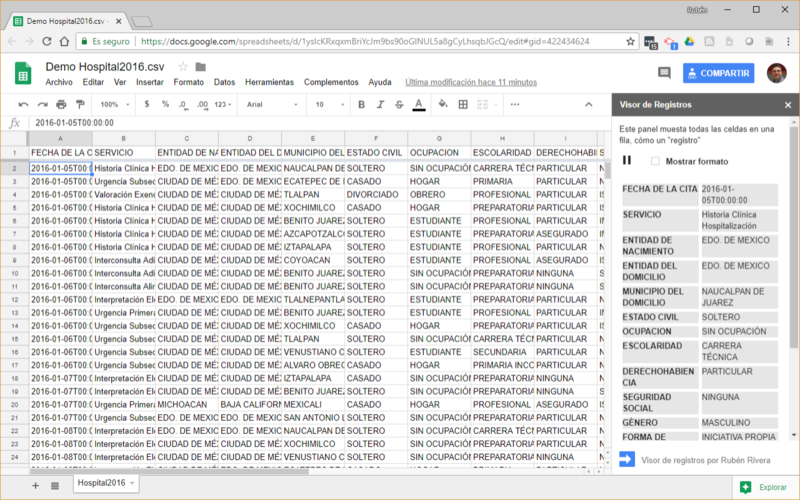 In cases that a formula like the one described above were not good, try Visor de Registros (Record Viewer), a Google Sheets free add-on developed by me. Currently it's unlisted but very soon I will send it to review by Google. It was published on August 14, 2018. Note: The website is in Spanish as it's the first language of the firsts users that help me to test the add-on. I hope that the Google Sites built-in translate feature were good enough, but the add-on UI is available in English and Spanish. This formula is better because it doesn't require to fill down in order to get the desired result for the all the rows in the data range. NOTE: The formula assumes that A2:A values are text and there aren't blanks on the data range.